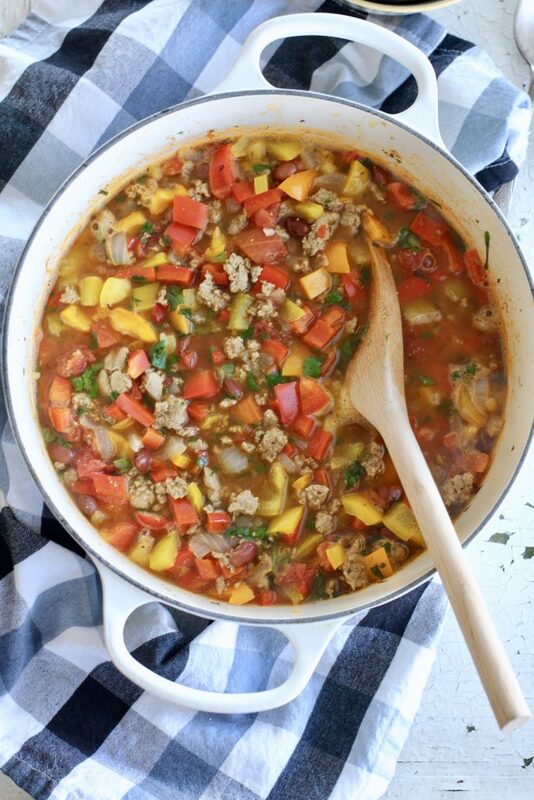 Turkey and Fresh Veggie Chili is a one pot wonder! Quick and easy and healthy too. Gluten free, dairy free and a great way to cut back on red meat, but still enjoy a filling meal. Sugarbuttereggshamturkeypiecookiescookiescookiescandygravymashedpotatoesrollschocolatenutspumpkin is where I was living for the past two months. It’s time to make an effort to eat something on the healthy side! 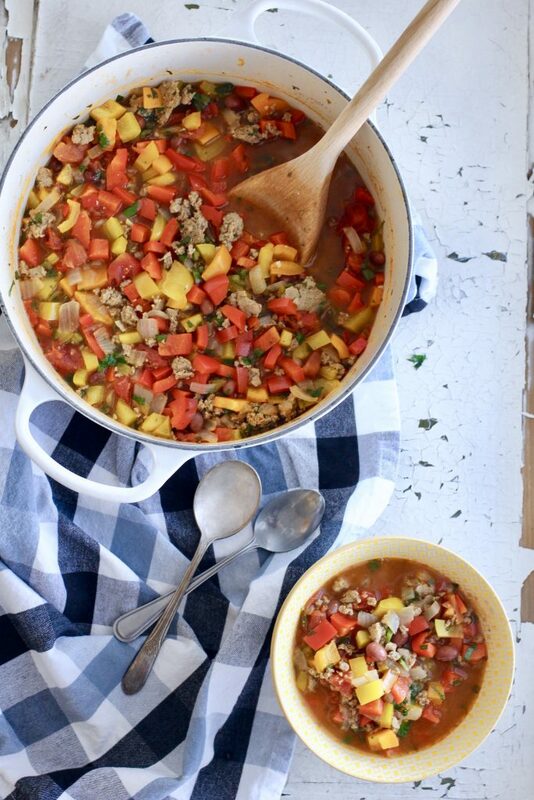 This Turkey and Fresh Veggie Chili is our new favorite dinner. It takes minutes to throw together and is loaded with good for you ingredients. We started off the new year with a little workout in the snow. Snowshoeing is something I love to do with Grant. It’s beautiful and peaceful and so fun to be out in the snow and sun. January is probably the most difficult month of the year to live in Utah. The Christmas let down has settled in and it’s just plain COLD. The once beautiful snow is now coated with black along the sides of the streets and thick layers of ice are starting to develop in areas that don’t see the sun. Ugh. One wonderful bright spot in the month of January is cozying up in the kitchen and making dishes that fill us up and keep us warm! 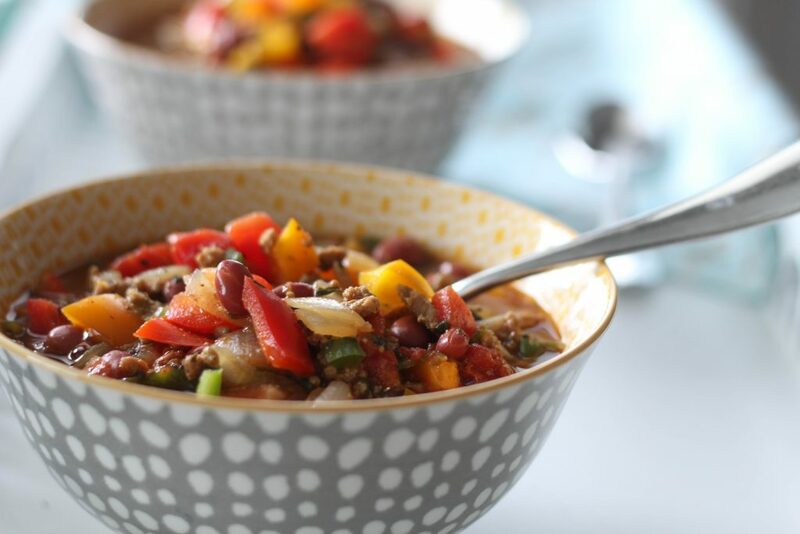 This Turkey and Fresh Veggie Chili is perfect for curing winter blues. Ground turkey? I’m usually not a huge fan, although I do LOVE this recipe for Ground Turkey Enchiladas which remains among my favorite enchilada recipes! I was going for something healthy and simple, colorful and fresh in this recipe. The problem with ground turkey- it’s kind of bland. You have to compensate with spices and flavors that really compliment the turkey. I choose many of the same flavors in the enchilada recipe mentioned earlier. 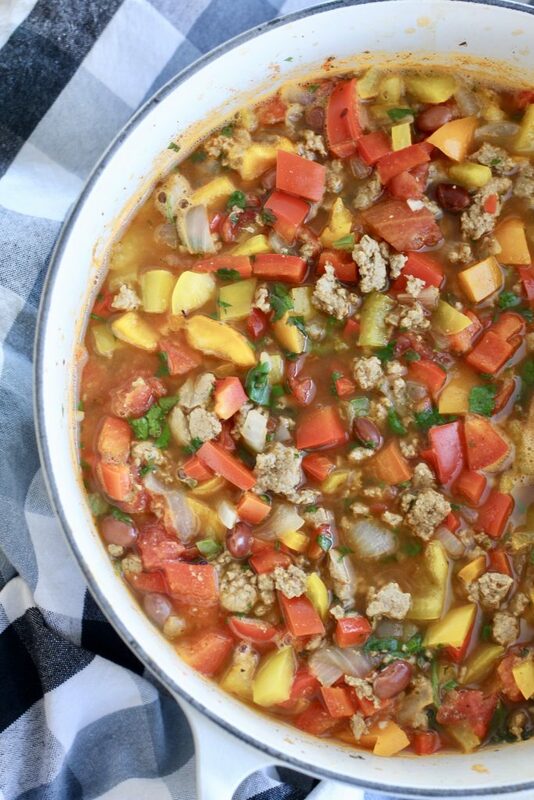 Lots of fresh peppers, onions, garlic and cilantro make this turkey chili as appealing to the eye as it is to eat! Instead of using a thickening agent that might add more calories, I whipped out one of my favorite kitchen tools, my immersion blender. KITCHEN TIP: I know. You’re thinking I don’t need that. I thought the same when my SIL gave me one years ago. In fact, it sat in the box, in my closet for about a year before I pulled it out one day. The immersion blender is my secret weapon when I want to make gravy or sauces smooth without pouring into a blender. I use it all of the time for making dressings too. Stick it in the jar or bowl and pulse or blend. The beauty of the immersion blender is it can blend hot liquid without a mess or danger of the hot sauce spattering. If you don’t have one, you can buy the same one I have here. 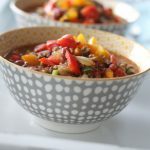 You can make this Turkey and Fresh Veggie Chili early in the day and leave it in a slow cooker on low (see notes on recipe), or it can be ready to eat in thirty minutes for a quick mid-week dinner. Either way, I know you’re going to love it. Place turkey and chopped onion into a large stockpot. Cook over medium high heat, stirring often to make sure turkey does not burn. While cooking, season with salt and pepper, cumin, chili powder and oregano. Cook for about 5 minutes, breaking up meat a bit while cooking. Add garlic and cook for another minute. Add all of the chopped chilies and peppers to pot. Using an immersion blender, place the blender into the pot of chili and pulse a few times to thicken the chili. You may also remove 1-2 cups of the chili and place in a blender until the chunks are gone, then pour the blended chili back into the pot. Simmer until ready to eat. -This recipe can be served immediately after making or left to simmer all day. 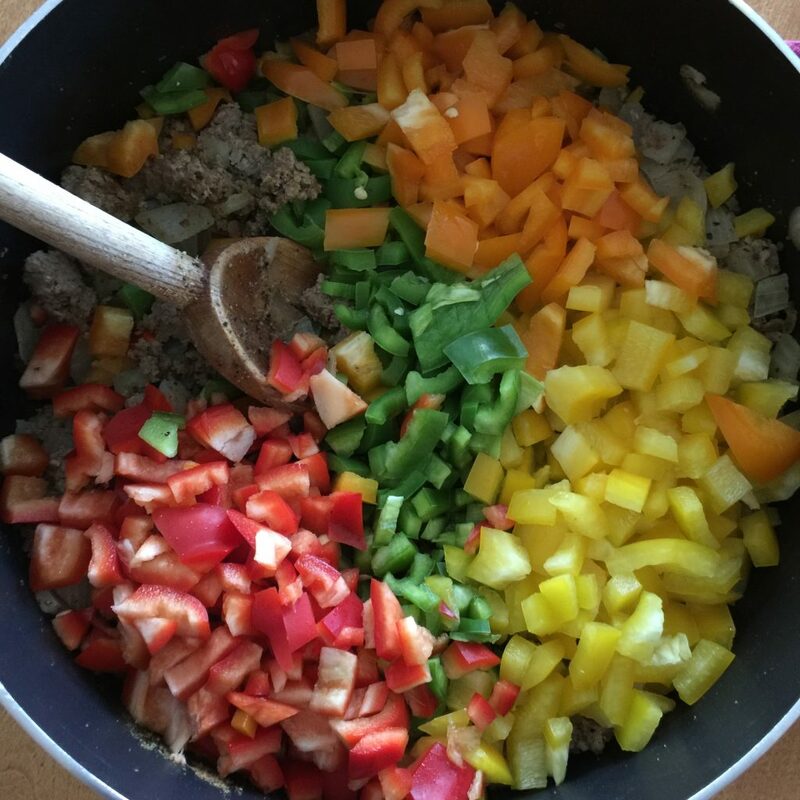 If served immediately, the vegetables will remain bright, if simmered for a long period of time, the vegetables will lose their color, but the flavors will intensify. -The chicken broth amount will vary according to how much liquid you would like to have in your soup/chili. You may also add a bit of water if you run out of chicken broth. 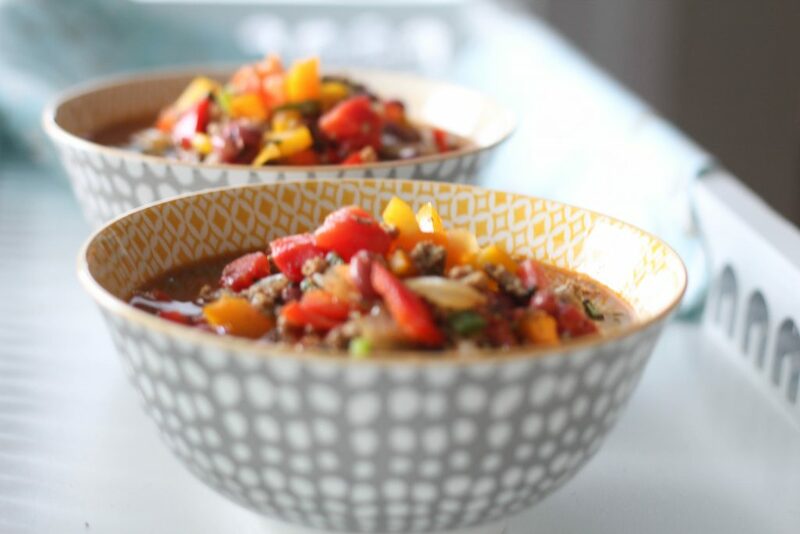 Broth will give the chili a better flavor.-to increase the serving amount, you may add an additional can of beans without adjusting the other ingredients. This is arguably one of the BEST go-to recipes! I just fed a hungry group of 9 men for cards night.. huge hit! I always double the recipe. If I don’t serve it all, it keeps well and is almost better the next day! I like to add a can of diced green chiles and sometimes a jalapeño or two. This time I added a little sprinkle of cayenne for some heat. Thank you so much for this great, easy, healthy, YUMMY recipe! Thank you Molly! I’m glad you love this recipe. Thanks for reading ABK! We made this recipe for Super Bowl Sunday and it was amazing! 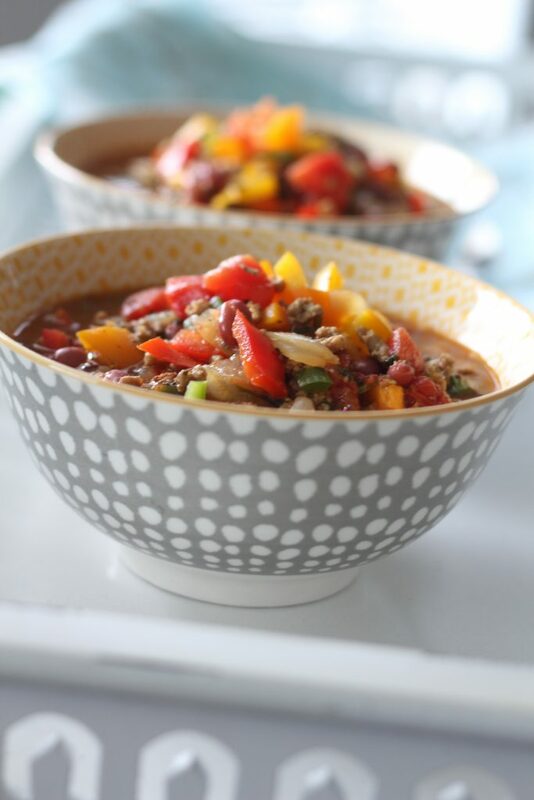 Most favorite chili recipe out there! We didn’t have anaheim green chilis so we substituted a can of mild green chilis, a can of creamed corn, and a can of hormel no bean chili and it was great! This is a great recipe! Thanks Alex! We love this recipe and make it often for a quick dinner! AWESOME, pretty, flavorful, quick meal. Will definitely make again (just with less heat). This sounds delicious, Liz! I love hearing all the variations people use for recipes. I might have to try this one. Thanks for sharing and for reading ABK! Love the freshness of this! Next time will try mashing the beans before I toss them in instead of tge immersion blender step. I love that idea of mashing the beans before putting them in. All the fresh flavors in this recipe make such a difference. Thanks for sharing!